We are continuing to look at how Jesus shared the Gospel while he was here on earth and what we can learn from it. If you missed last week’s post, you can check out part 1 of “What Does Jesus Teach us About Sharing the Gospel” here. Our lives are a great tool to preach the gospel of Jesus. People pay attention to the way you live. When we choose to follow Jesus and believe in Him, accepting the Holy Spirit into our lives, the way we live changes and people should notice. The light we receive will be noticed in our homes, schools, businesses and communities. They way we live and the things we say and do should be of God and should point towards God so that others will see His glory. This goes beyond simple manners of being polite, nice or living well. It means living with bold conviction, it means praying for people, laying hands on those who need healing, whether its physically, emotionally, spiritually, mentally, or financially. It means having consistent steadfast faith through mundane, every day circumstances. It means being transparent about the intimacy we have with God. It means walking with God in every circumstance, relying on him and being honest with others about the good things he has done for you and for others. This kind of lifestyle is impossible to ignore. Prayer is a strong tool and it works. As we go throughout our days, one of the best things we can do to be prepared is ask the Holy Spirit to give us the right words. When we yield our voices to Him, He always comes through. And even when we aren’t sure if what we’re saying is helping, we can trust in the Lord that He is at work. We are shown this in Acts and when Jesus tells his disciples of our helper, the Holy Spirit. Because of this help, we are destined to do even greater things than Jesus did as a man here on earth. If we are to do these greater things, then where do we start? During Jesus’ ministry, He taught in the synagogue the words of Isaiah, words that Jesus fulfilled. to proclaim the good news to the poor. By our works carried out in faith in obedience to the ways of Jesus because of our love for Him – praying with the laying on of hands, people being healed, people seeing, being cleaned, walking away from hurt, pain and addiction – people believe and they see the Kingdom of God in action. Jesus teaches us how to declare and expand the Kingdom of God not only by preaching and sharing the good news, but also by living it out and performing the same works of Christ – not for our gain, not for the purpose of winning our salvation or the favor of God, but to show the world the goodness and power and authority and grace of God. The word fear is not read in the common sense of being afraid of God. Instead it refers to the acknowledgment of the grand wonder, majesty and Lordship of our Heavenly Father over our lives and all of creation. As we carry out The Great Commission and head out into the world carrying the calling of the Lord to share the gospel and show the kingdom of God with all creation, we are to live with this fear of the Lord. Understand that evangelism carries eternal consequences and the fear of man doesn’t hold up well in comparison. 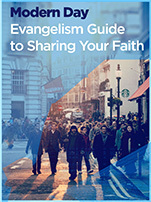 Evangelism isn’t just something that makes us good Christians. Sharing our faith isn’t a casual cause. Jesus made the preaching of the gospel and the declaration of the Father’s love an integral part of his ministry. As believers we are continuing this ministry of the Kingdom of God. Following Jesus’ teachings gives us the perfect foundation to carry out this calling with excellence. Next week we will look at how we can actually become fisher of men in the 21st century.